If you're uncomfortable with the adjustment of your handle bars, change it. Here's how I did mine (and how BMW suggests to adjust them). I have seen many BMW Cruisers running around with the handle bars poorly adjusted. Poor adjustment of the handle bars can cause any number of problems from poor handling to a sore back. This is the way I adjusted the bars on my bike as well as on the Tech Bike. The handle bars on the Tech Bike were adjusted wrong (according to BMW). 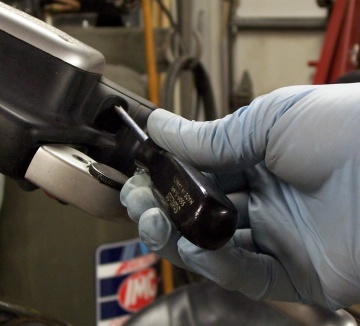 Many dealers as well as owners don't know the adjustment requirements and just simply adjust the handle bars to the same angle as the forks. 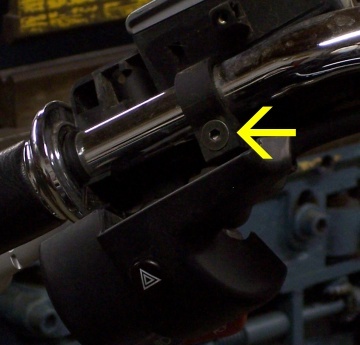 BMW calls for the handle bars to be adjusted so when the forke are turned to full lock either way, the bar end is no more than one and a half inches from the top of the gas tank. 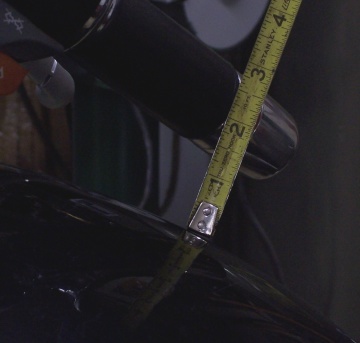 Looking at the above photo, it's easy to see the handle bar measurement is off by about four and a half inches. This is how I dealt with the situation. First I started off by covering the gas tank with a couple of layers of towels (in case I made a boo-boo). I loosened the handle bar clamp at the base of the bars using a 6mm hex key. I wanted to be careful not to loosen the bar clamp too much as the bars would then just fall down and cause a boo-boo on the tank top. 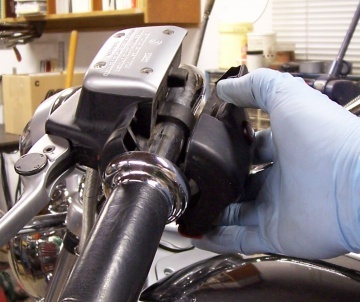 Once the handle bar clamp was loosened just enough to allow the bars to be moved up or down with some resistance, I turned the forks to full lock and moved the bars to about one and a half inches from the top of the gas tank. Bars adjusted to within an inch and a half of the tank top. Once the bars were in the right spot, I re-tightened the handle bar clamp. Now comes the hard part, adjusting the lever perches. 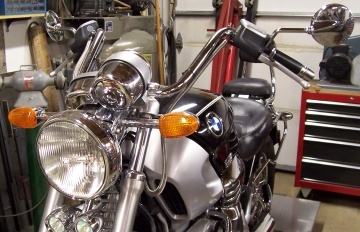 On the 1998 and earlier BMW Cruisers, you can leave the mirrors on BUT on 1999 and later BMW Cruisers, both mirrors need to come off. Because the Tech Bike is a 1999, I had to remove both mirrors. 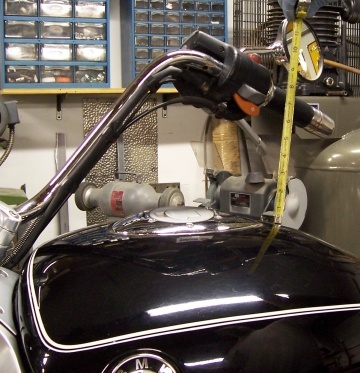 Removing the mirrors requires a 6mm hex key, the throttle side mirror is a bit fussy getting the nut off and on but it can be done without removing any of the throttle parts. There may be spacers on the mirror stems and washers on the attachment nuts, so, a heads up there. The spacers will likely just stay in the mirror holes and don't really need to come out. Adjusting the left side hinge or lever perch, to get at the adjuster screw, the switch has to come off. I started off removing the small, hidden philips screw (#1 philips on 1999 and later bikes) behind where the mirror stem would be. I then removed the screw in the front of the switch, (#2 philips). Lastly, I removed the screw in the bottom, behind the turn signal switch blade (again, a #2 philips). Rolled the switch off it's mount starting at the top and rolling towards me. With the switch out of the way, the hinge or perch mount is visible. The hinge or perch adjustment screw. Loosen the perch adjustment screw (4mm hex key) and adjust the perch to where it feels good, usually when the lever is about level. After the lever is in a good position, I snugged the adjustment screw back down, tight enough to stop the perch from rotating easily on the bars but not so tight that if the bike get's dropped, the perch will rotate rather than breaking the lever. Roll the switch back into place, allign the screw holes and remount. At least two of the screws only go back into plastic, so, snug is the word, not tight. Plastic is so easy to strip out. The right side goes about the same, remove the screw in the switch face, the hidden one behind the mirror stem (on 1999 and later) and the one in the bottom by the cable guide. Roll the switch bank off the perch, again starting at the top. The perch or hinge adjuster will now be visible. Again, with a 4mm hex key, adjust the perch to where it feels good. Snug the perch adjustment screw back down, roll the switch back in place, screws in and it's done. Refit the mirrors, washers, nuts and any spacers that may have come out. Snug down the mirrors, sit on the bike, adjust the position of the mirrors and tighten them down, re-check the adjustment and that job is done! Bars adjusted, perches adjusted, mirrors adjusted,.... who's up for a ride?